Even now, almost a year after the launch of the Ryzen Threadripper processors by AMD, there are only a few X399 motherboards available in the market. Threadripper aims for the top end of the enthusiast and workstation market, and comes with a price tag, therefore it is only natural that motherboard manufacturers would not expend much of their resources on such a limited market. As a result, GIGABYTE only offers two motherboard options to date: the gaming-focused AORUS X399 Gaming 7 and the feature-packed X399 Designare EX, but we do know that an X399 Aorus Extreme is also set to be released in the near future. In this review, we are having a look at the X399 Designare EX, the current GIGABYTE Halo implementation of AMD's X399 chipset. The Designare EX is the most expensive and feature-packed motherboard GIGABYTE has to offer, yet its features seem to have been selected with productivity in mind. For example, gaming-specific features such as an Intel E2500 Killer LAN gaming chipset are implemented on the cheaper AORUS Gaming 7 motherboard, yet not on the Designare EX, instead going for dual Intel networking ports and Wi-Fi. As its name hints, GIGABYTE is probably targeting this motherboard more towards professionals and designers. The GIGABYTE X399 Designare EX is a motherboard designed to be both feature-packed and reliable. Its list of features is very long and, despite the massive size of the processor's socket and the eight DDR4 RAM slots, the dimensions of the GIGABYTE X399 Designare EX are exactly those of a typical ATX motherboard, allowing it to be installed inside any typical ATX-compliant case. A quick glance at the motherboard's specifications reveals that up to eight SATA drives and three M.2 drives can be connected on the GIGABYTE X399 Designare EX. 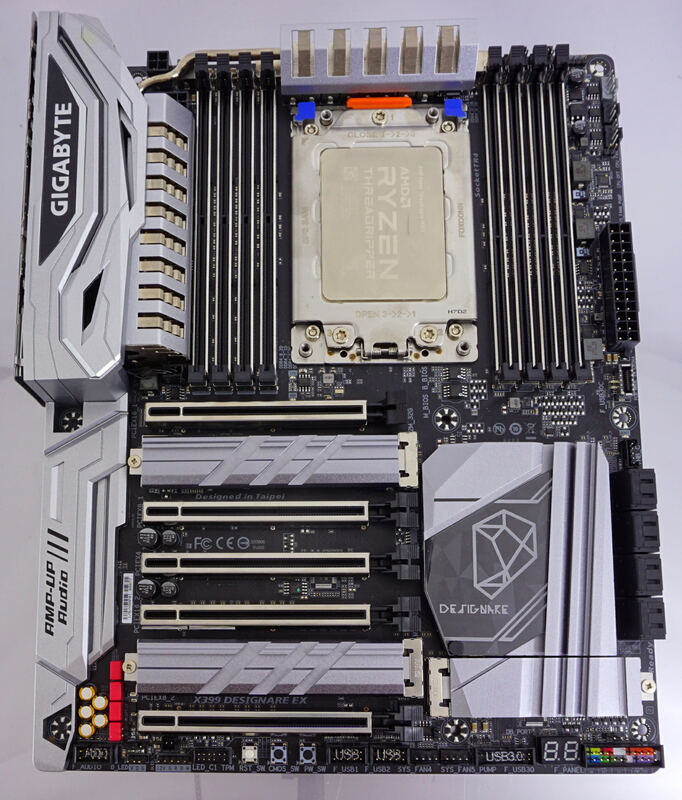 The motherboard does not have a U.2 drive connector, making GIGABYTE the only manufacturer who did not add one on their top-tier AMD X399 motherboard. However, GIGABYTE supplies a U.2 to M.2 adapter, allowing the connection of a U.2 drive onto any of the motherboard's three M.2 slots. The motherboard also has a massive number of USB 3.1 Gen 1 ports and there are also two USB 3.1 Gen 2 ports, one Type-A and one Type-C. In terms of connectivity, the motherboard has dual Intel I211-AT Gigabit LAN controllers, plus an Intel 802.11ac/Bluetooth 4.2 wireless adapter. The I211-AT are renowned for their efficiency and stability (and it is not bad for gaming either). The wireless card supports speeds up to 867 Mbps. GIGABYTE heavily advertises the audio capabilities of the X399 Designare EX, focusing on the Creative Sound BlasterX 720° support. Note that Sound BlasterX 720° is not a chipset but a software package that is designed to work with any compatible chipset/motherboard. Realtek supplies the well-known ALC 1220 audio chipset that also has an integrated smart headphones amplifier. One of the truly unique features of the GIGABYTE X399 Designare EX is the presence of a fifth full-length PCIe slot. 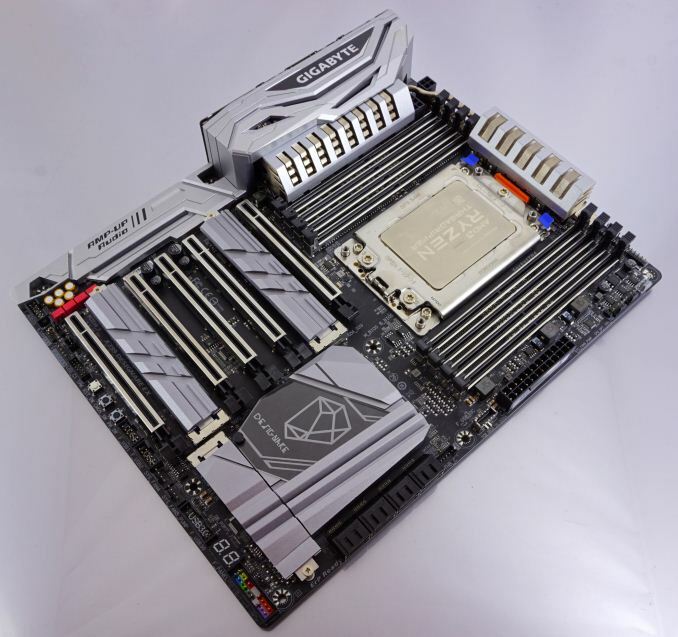 Like every other AMD X399 motherboard, the GIGABYTE X399 Designare EX has four PCI Express slots that are directly connected to CPU lanes (×16 / ×8 /×16 / ×8), but right in the middle of these four slots, the Designare has an added a fifth full-length PCI Express slot with four lanes connecting to the chipset. 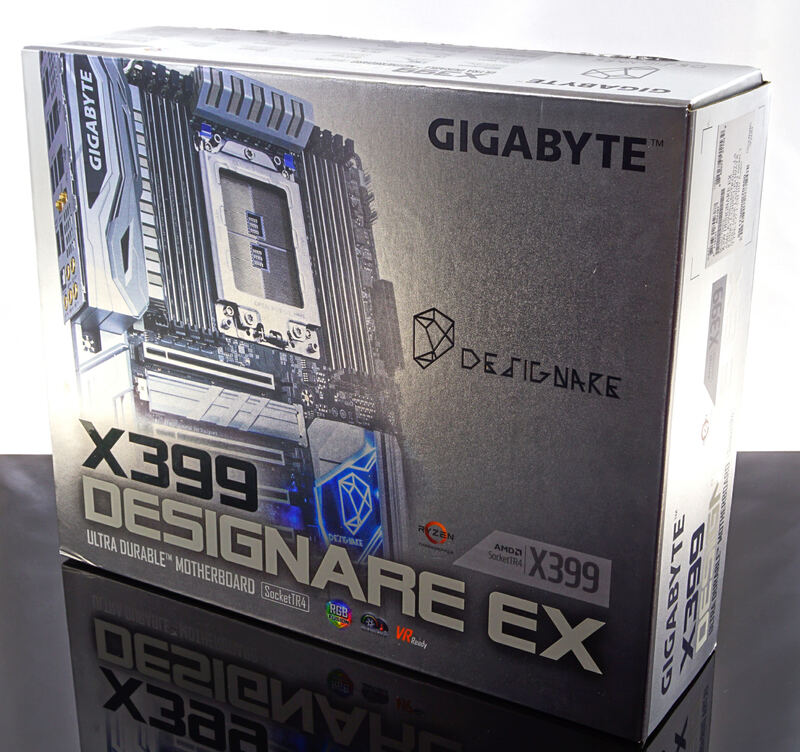 The second important feature of the GIGABYTE X399 Designare EX is the implementation of an International Rectifier IR35201 digital controller. What is unique about this particular controller is that it implements an algorithm that balances the load (and the heat output) across all of the power phases. This means that instead of having a couple of stages heavily loaded all of the time while the rest are idling, all eight stages are continuously sharing about the same load, greatly increasing the longevity of the circuitry. This means that the motherboard should hold up well for the upcoming Threadripper 2 launch. Overall, the X399 Designare EX is a motherboard that seems to be leaning more towards professionals. There are gaming-related features, such as RGB lighting and support for external RGB strips, but these are more of an exception rather than the rule. The company refrained from adding gaming-focused chipsets or complex/untested circuitry, sticking to heavily tested and proven choices. As we will see in the following pages, GIGABYTE also focused on the cooling capabilities and the physical strength of the motherboard a lot as well, hinting that the X399 Designare EX has been developed in order to please users who seek stability and reliability above all else. I agree. When TR 2 hits I would highly recommend Anandtech do an "undervolting Threadripper" page that compares Gen 2 an Gen 1 — on multiple boards. And, since this is a pro product, the overclocking stability threshold needs to ensure real stability, not the quick and dirty standard. Z170->270->Z370 is similar with minor updates to bling and the vrm circuit but nothing exciting. X299 apart from evga's isn't very interesting. "The second important feature of the GIGABYTE X399 Designare EX is the implementation of an International Rectifier IR35201 digital controller. What is unique about this particular controller is that it implements an algorithm that balances the load (and the heat output) across all of the power phases. This means that instead of having a couple of stages heavily loaded all of the time while the rest are idling, all eight stages are continuously sharing about the same load, greatly increasing the longevity of the circuitry. This means that the motherboard should hold up well for the upcoming Threadripper 2 launch." The IR35201 is not the reason any board will fulfill the power delivery needs ofa TR2, fets and phases will.